For Spain Albert Beltran (9th) Alvaro Iglesias (27) scored a goal each to give their side a 2-0 lead but Hayden Phillips (50th) reduced the margin and then Kane Russell (56th)equalized for New Zealand. The Kiwis with 4 points from three matches are assured to play cross over to decided their quarter final fate. Spain with two points from three matches are very precariously placed. Spain have themselves to blame for the fate,After dominating the game most of the time and leading 2-0 till ten minutes before the final they conceded the two goals and the advantage by defensive lapses..
With early elimination staring at them, a desperate Spain, having only one points from two outings entered the field to win the last league match to remain relevant in this tournament. There plan was simple and focused, attack, attack and get the goals as quick and as many possible. The Kiwis citadel was all surrounded by the Red sticks who seemed intent not to give any quarters to their rivals. The Kiwis retaliation was furious which caught the Spaniards on the wrong foot but speedy striker Marcus Child fumbled while taking the shot and his reverse hit went wide off the target. The black sticks tried to keep the momentum going but Spaniards battling for survivals did not allow them much space to move and kept them into their half. Spain kept attacking from the centre and right flank with. Enrique Gonzalez leading the charge but many a time he lost the advantage on the edge of the circle as he was not able to get past the defenders. Spain had a chance to increase the lead as Diego Arana made a dash from the right but his shot was well anticipated by the goal keeper Richard Joyce who positioned himself perfectly to foil the attempt. Spain earned a penalty corner in the 25th minute but instead of taking a direct crack they went for the variation and relayed it to Albert Beltran who was at the near post, but the youngster fumbled too trap the ball properly and the chance was wasted. As the red sticks kept attacking, the Kiwis got out of their shell and launched a frontal attack and right out of nowhere, they pulled one back. Hayden Phillips received a pass from Hugo Inglis on the left side and he smashed it into the roof of the net (1-2) this happened in the 50th minute. 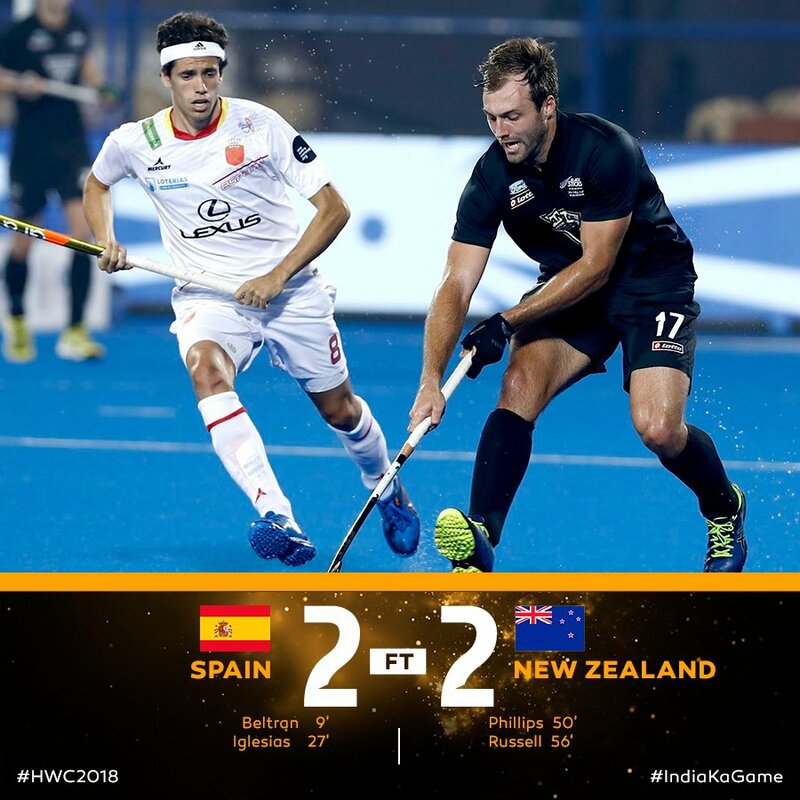 Six minutes later the Kiwis equalised as Spain offered too much space on the right side and the Black Sticks were awarded a penalty corner. Kane Russell’s drag flick was right on the target (2-2). The Red Sticks skipped a beat in the dye moment .. Stephen Jenness was completely unmarked on the right side but his furious reverse hit, missed the target by a whisker.